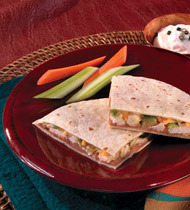 Try our Chicken Cheese Quesadillas made with our Pace® Picante Sauce. Made in about 30 minutes, this simple and quick meal is sure to be a crowd pleaser. cooked diced chicken	 2 lb. Cheddar cheese, shredded	 24 oz. 1. Preheat oven to 425°F.Mix chicken, salsa and cheese. flour tortilla, 8-inch	 24 ea. 2. Lay flour tortillas on a clean work surface. Top half of each tortilla with 1/3 cup chicken mixture Spread to within 1/2 inch of edge Fold over and press edges together. Place on a parchment paper-lined sheet pan. 3. Brush filled tortillas with oil. 4. Bake for 8 to 10 minutes. 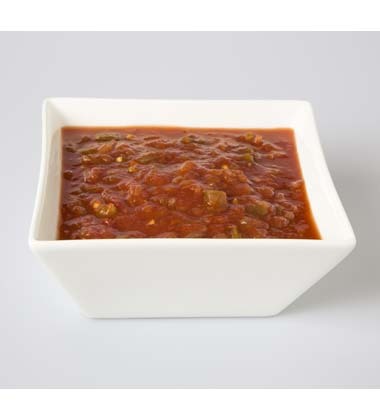 Cut in wedges and serve with additional salsa. CCP: Hold at 140°F or higher for service. If left over do not reuse.